Peach is probably the most adapted temperate fruit to the warmer climate. Besides being cultivated in the temperate climate in the hills, it is also cultivated in the north Indian plains in the states of Punjab, Haryana, Rajasthan and Uttar Pradesh. This area has a subtropical climate. The subtropical peaches come in the market early in season (mid-April), growers can get higher returns due to scarcity of other fresh fruits. Its first commercial crop is obtained within three years of planting which is much earlier than majority of other temperate fruits. Therefore the cultivation of subtropical peaches has expanded at a faster pace. Peaches can be grown over a wide range of soils but they thrive best on well-drained loamy soil. They do not flourish on heavy, wet soils. The soil should be free from any hard pan or lime concentration within top two meter. Moderately fertile and deep soils are good. 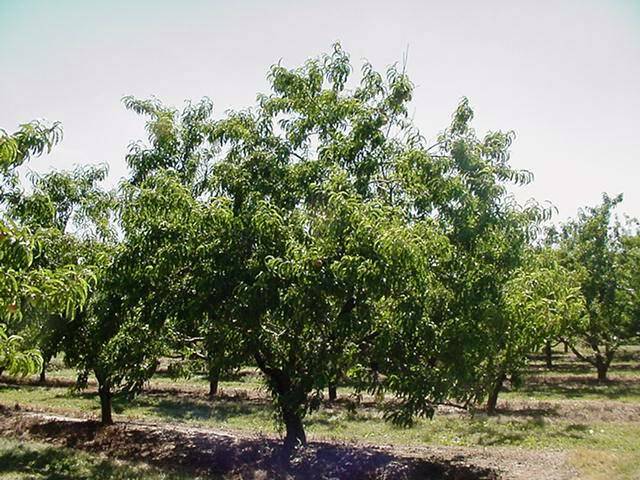 Poorly drained soils are often the cause of failure of peach orchards. On the other hand, too light soils are also not good for peach cultivation, since these soils are low in their nutrient-supplying capacity. They often show deficiency of N, P, Fe and Zn. Peach nematodes also develop quickly in sandy soils, requiring corrective measures more frequently. 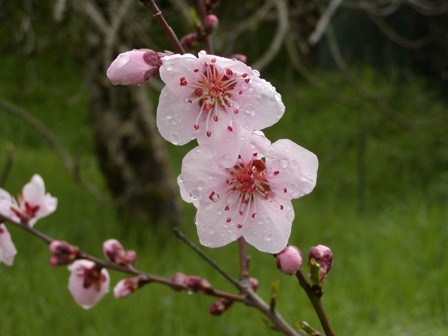 Peach trees are more tolerant to warm climate than other stone fruits. Therefore, they can be grown successfully over a wide range of climatic conditions. During winter, peach trees shed their leaves to enter rest. To come out of rest, they need some low temperature; otherwise, their growth and blossoming become erratic and abnormal. Thus, varieties having low chilling requirements of 250-400 hr can be grown in the sub-mountain regions and plains. It plains it grows at an elevation of 240-450m. Table1. Peach varieties for subtropical climate. It is the earliest-maturing peach (mid-April), and fetches good income to the growers. Fruits are medium-sized, roundish with and attractive red blush. It is white- fleshed when fully ripe, the average yield being 50kg/tree. It matures in the third week of April (one week earlier than Flordasun). The fruits are yellow with red blush. Flesh color is also yellow with red coloration. It has better firmness and keeping quality than Parbhat and Flordasun, the average yield being 70kg/plant. It matures in the last week of April. Fruits are medium to large, roundish and yellow with red blush. Flesh is yellow, juicy and sweet. With free stone, on an average it yields 75kkg/ tree. It matures in the first week of May. Fruits are very large, yellow with red blush, juicy, sweet, excellent in taste, and free stone. Since fruits are firm in texture, they can withstand transportation. These are suitable for canning, the average yield being 70kg/tree. An excellent, mid-season table peach, it matures in the beginning of June. Fruits are large, almost red at maturity, juicy, with white flesh and free stone. Its average yield is 100 kg/tree. Fruits are large, attractive with red coloration, cling stone with white soft juicy flesh. Fruits are large, greenish-yellow with rosy patches, very juicy with excellent taste and flavour. Fruits ripen during June-end to first week of July, the average yield being 100-120kg/tree. Its fruits ripen in the last week of April. Fruits are medium to large, round with little or no tip, red blush, with yellow ground color, flesh melting, yellow with some red color, semi-cling. On an average it yields 100 kg/tree. It ripens in the first week of May. Fruits are large with red blush surface. Flesh yellow, firm with some red color next to pit, semi-free when fully ripe, the average yield is 95kg /tree. The fruits possess excellent shipping qualities. These peaches are generally propagated by budding or grafting on seedling rootstocks raised from Sharbati or Sufaida peach or any other peach variety having high germination rate and a desirable growth habit. For raising rootstock, stones from ripe fruits are extracted in June or July when Sharbati peach ripen. The stones are extracted from fruits within 2-3 days of picking of ripe fruits. The long storage of stones in pulp damages the seed or kernel, making it unfit for germination. Stones are stored for three months in gunny bags under dry cool conditions to complete the ripening period of embryo. Fresh seeds do not germinate. The embryo becomes dormant and does not germinate if it is sown directly during January-February in the field. Therefore, seeds are stratified for 45-90 days at a temperature of 6-12`C in the moist sand to break the resting period of embryo. The stratification period can be reduced if seeds are treated with GA solution and then stored at low temperature. After stratification, the stones are sown in February –March in the field. Seeds sown outdoor in November get the desired low temperature during winter months and germinate in the following spring. About 30-40% seedlings become ready for budding in May-June to September. T-budding and ring budding give satisfactory results. Remaining seedlings become fit for grafting in December-January. Healthy plants of known should be obtained from a reliable nursery preferably near to the orchard site. They should be planted in January when still dormant. Planting should be done by digging 1m x1m x 1m pits and refilling them with the fertile top soil mixed with 40 kg of well-rotten farmyard manure in a pit. Add 30 kg of Lindane (5% dust) or 5ml of Chlorpyriphos 20 EC mixed in two kg soil to control white ants in each pit. Planting distance should not ordinarily be less then 6m x 6m from row-to-row and plant –to-plant, accommodating 225 plants/ha in square system. After planting, provide stakes or supports to the plants if needed. Remove dead and diseased portion by careful pruning. Provide adequate protection against summer and winter. Keep examining the young plants and remove stock sprouts and suckers. Do not give fertilizer during the first year. Peaches trees are generally trained to rather row head according to modified leader system to build a strong framework. For this, 1-year-old saplings are planted in the field. Soon after planting, the plants are headed back to a height of 90cm from the ground level. As soon as they grow in spring, all the shoots on plants are allowed to develop for 3-4 weeks. After this, 4-5 well-spaced laterals are selected as the main framework of the tree. The lowest lateral should not be below 45cm from the ground level. All other shoots are removed at this time. The topmost lateral branch is called leader. At the time of second pruning, 3-4 more laterals are selected on the leader branch. The leader is headed back suitably very close to an outward growing wide-angled lateral. The side growth on the scaffold branches selected in the previous year should also be suitably thinned out. One-year-old trees start bearing. Young bearing trees should be pruned every year either by thinning out or heading back technique. Either method is not good. A combination of the two may be more useful to contain tree size and to regulate crop load and quality. Generally peaches are pruned hard. Although pruning decreases total yield, it improves marketable yield and quality, enhance fruit maturity and improves tree vigour. Therefore, about 40% of 1year-old shoots should be done to produce 50-100 cm growth in young trees and 30-70cm in old trees annually. For eight year old trees, it is desirable to head back and thin out some of the main branches every year to encourage development of new fruiting wood. Mid-December to January-end is best time of pruning in the subtropics. Since peach trees bear heavy crop, they need to be fertilized regularly. It is not possible to recommend a definite amount of fertilizer for a given orchard since fertilizer requirement varies from orchard-to-orchard. However, 10kg farmyard manure, 180g urea, 190g super phosphate and 150 g muriate of potash/ year up to the three year old trees should be given. After four years and above, the dose should be increased to 25kg farmyard manure, one kg urea, 760g superphosphate and 830 g muriate of Potash. Apply super phosphate, muriate of potash, farmyard manure during December and half of N in January before flowering. The remaining N should be given after the fruit set. Peach trees overbear, resulting into small-sized fruits. Therefore, thinning of fruits is quite necessary. It increases fruit size significantly and improves fruit color and quality. About 5% of the flowers should set and develop fruits to full maturity. To obtain large-sized fruits, they should be hand-thinned keeping 10-15 cm distance between the fruits 4-5 weeks before harvesting a particular variety. Proper pruning also helps in the thinning of fruits. Weeds compete with the trees for moisture and nutrients. They can be controlled by manual weeding but it is laborious and costly. Since peach roots are shallow, they are likely to be damaged by continuous ploughing. Therefore, use of herbicides is a good alternative. A pre-emergence application of Diuron @ 2-2.5kg/ ha or post-emergence application of Glyphosate @1.5 liter/ha in 500 liters of water during February-March effectively controls broad-leaved weeds and annual grasses in young orchards. The optimal use of peach fruit varies with the purpose or its use. If peaches are to be marketed in the nearby place, they may be allowed to ripe on trees. For shipping to longer distances, peaches should be picked at the firm ripe stage and pre-cooled in cold running water for a short period to remove the field heat and to retard the ripening process. As fruits mature, the ground color changes from green to yellow in yellow-fleshed peach Partap, Floridasun and Shan-e-Punjab. Development of red blush on fruit surface facing the sun is also evident. The white fleshed cultivars Khurmani, Sharbati and Prabhat develop creamy ground on their maturity. The TSS increases, acidity decreases and TSS: acid ratio improves. The maturity of peach fruits should never be tested by pressing the fruits between thumb and fingers as it causes bruising. 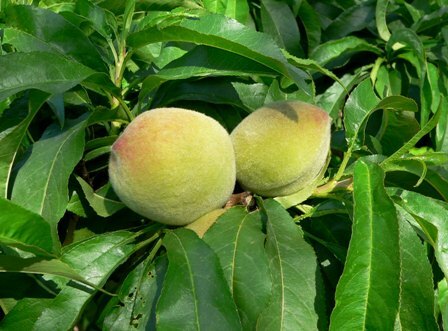 Early –ripening peach Prabhat, Partap and Flordasun take 60-70 days after fruit set to maturity, 80-90 days mid-ripening peaches varieties and 100-105 days for late varieties. Fruit firmness at the shoulders is also a useful index to judge fruit maturity. The pressure value should range from 8 to 14 ib/2.5 cm2depending upon variety. All the peach fruits do not mature at one time. It is, therefore, advisable to make 3-4 pickings starting with the largest and best colored fruits. Peach fruits should be graded and then packed in wooden boxed lined with newspapers or some locally available material. Usually three layer packs containing about 10kg fruits are preferred in the Indian market. Peaches can also be packed in two kg ventilated cardboard boxes of 28cm x 20 cm x 5cm size. These boxes packed in ventilated wooden boxed can be sent to market. Pre-harvest application of calcium nitrate (1.5%) increases storage life of peaches for 6-9 days, reducing weight loss, respiration rate and incidence of diseases during storage. Peach fruits harvested at proper maturity can be stored satisfactorily for two weeks at o`-3.3`C and relative humidity of 80-85%.